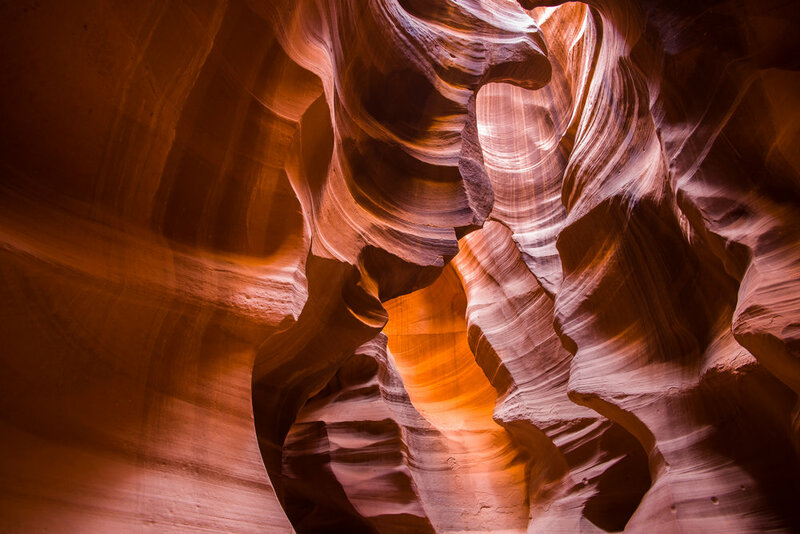 Antelope Canyon is world famous for it's magical and astounding beauty. 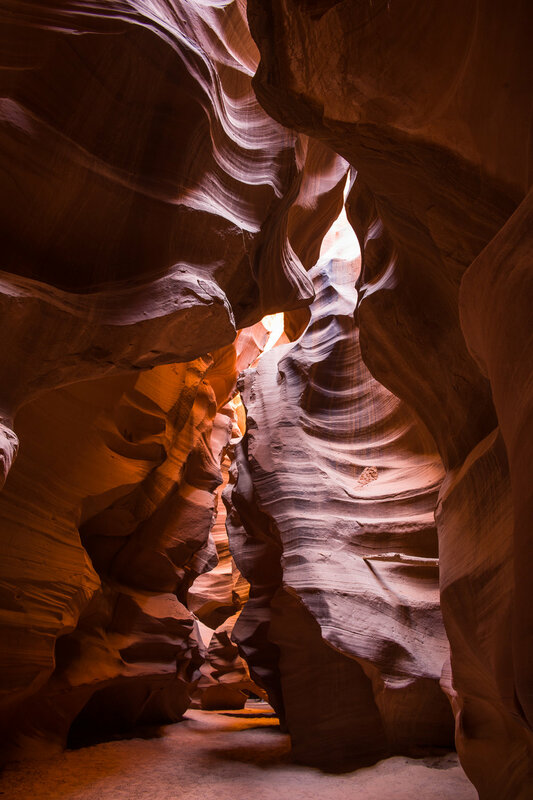 These slot canyons were slowly carved by natural erosion through red sandstone. Antelope is one of many, and the most famous. 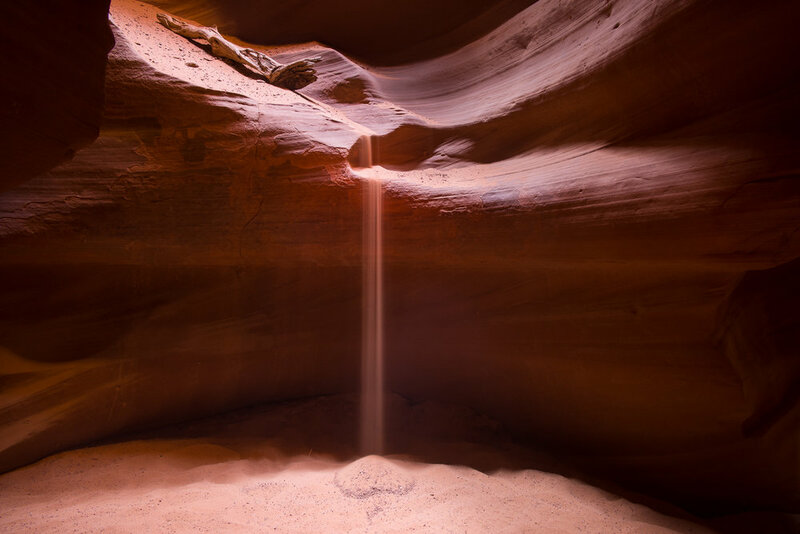 A slot canyon is significantly deeper that it is wide. You can visit them on the outskirts of Page, Arizona. This area belongs to the Navajo Nation which occupies portions of northeastern Arizona, southeastern Utah and northwestern New Mexico. Page is a small town that exists in the extremes of humanity and nature. The area around Page is inhospitable and desolate. 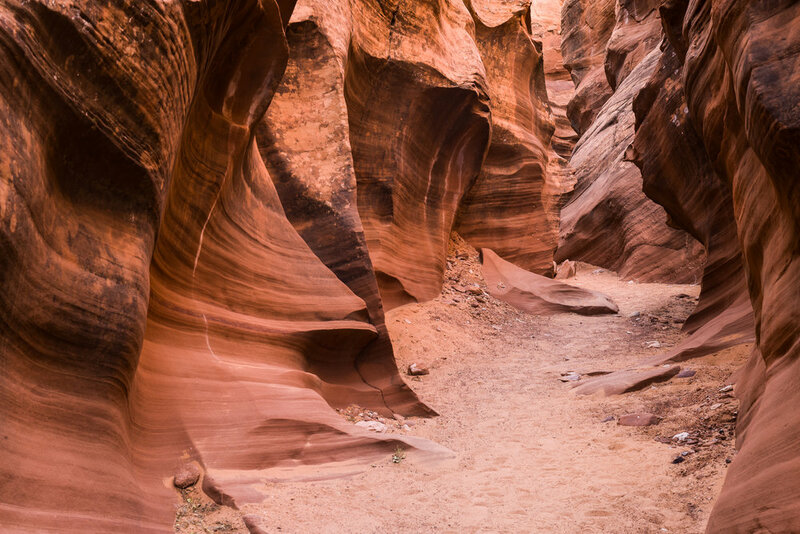 The canyons are sacred Navajo sites. Not much grows in the Arizona desert but what does grow here has protective thorns. 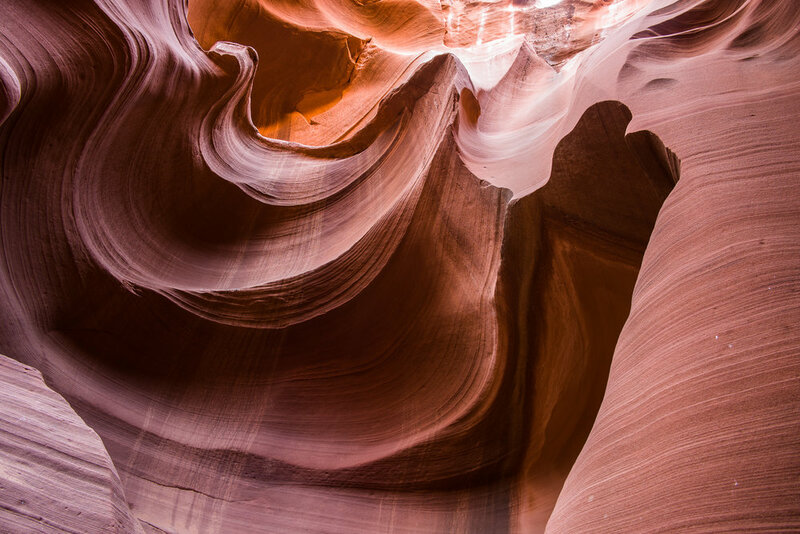 The beauty of the exposed and weathered rock is breathtaking. 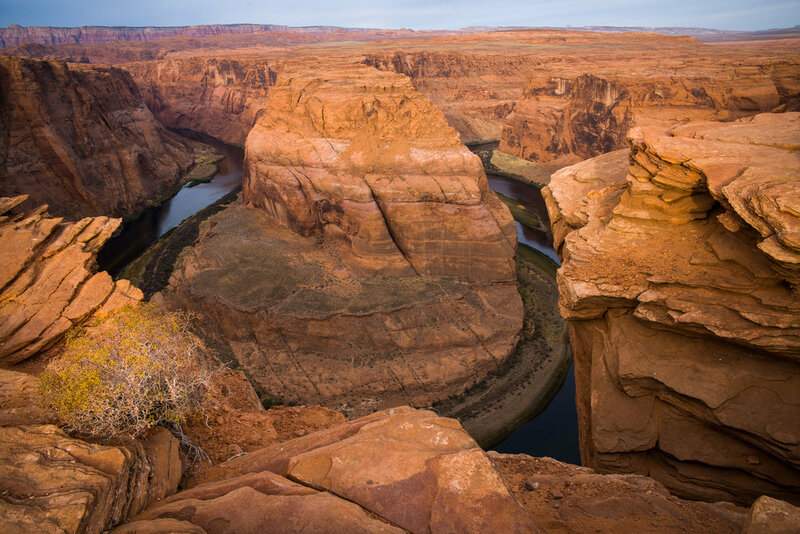 The majestic Colorado River cuts a U-Turn through these rocks to create the famous Horseshoe Bend. Natural but extreme. The power of human will created the town of Page. The community was founded in 1957 to house workers for the Glen Canyon Dam project. In October 1956, President Eisenhower set off a dynamite blast from the White House commencing the construction of Glen Canyon Dam. This blast was the first of many that carved a notch in the cliff walls securing the 710 foot tall Glen Canyon Dam into solid stone. This dam on the mighty Colorado River turned Glen Canyon into Lake Powell, the 2nd largest reservoir in the United States. Too many Native Americans and environmentalists the dam is a travesty that continues to cause immense damage to the Grand Canyon simply to provide more water for a growing population. In 1950 the Bureau of Reclamation presented a comprehensive plan to Congress for a series of dams in the upper basin called the Colorado River Storage Project (CRSP). 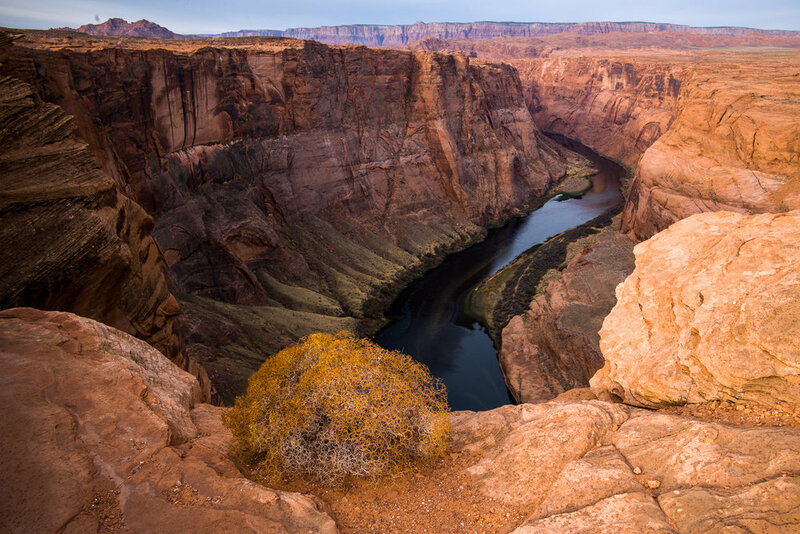 The proposal included a large dam in Glen Canyon on the Colorado River. The Western states were growing rapidly in population and importance, they needed water and power to grow. This area is desolate wilderness and the idea of turning unused desert into a lake that produced water and electricity seemed audacious and brilliant. It is a Hemingwayesque theme of man over nature. In the 1950's there was a military hero in the White House. The US believed anything could be accomplished if you put your mind to it. So the CRSP plan was adopted and the dam was built. 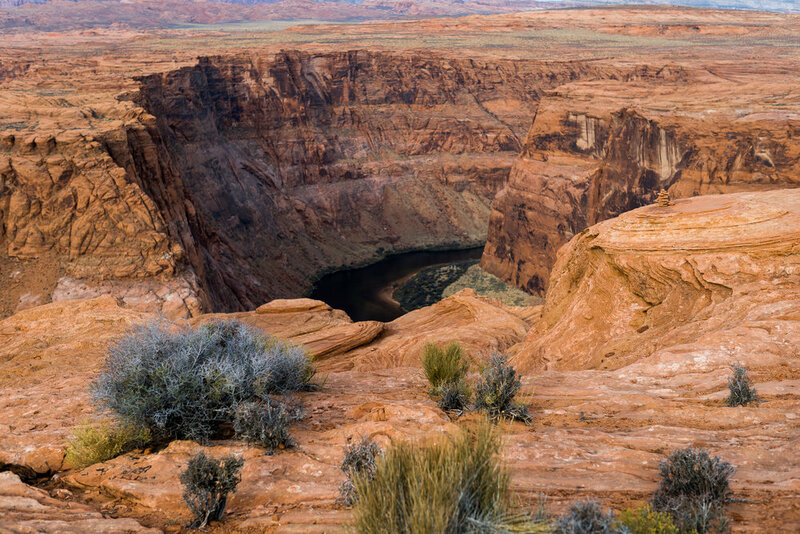 Some say Glen Canyon was the magnificent melding of 2 National Parks - Grand Canyon and Zion with cliffs and colors and arches. The massive Rainbow Arch lies submerged deep under the waters of Lake Powell. 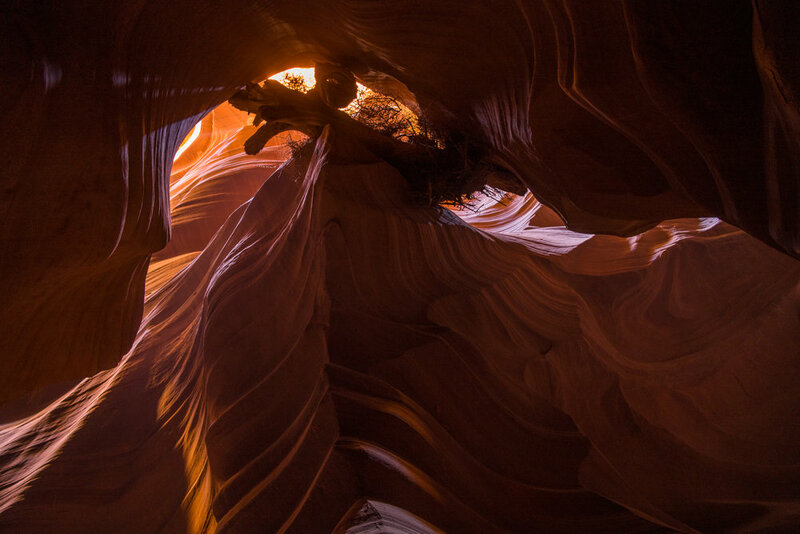 Photographer Philip Hyde captured the best photographic records of pre-dam Glen Canyon. 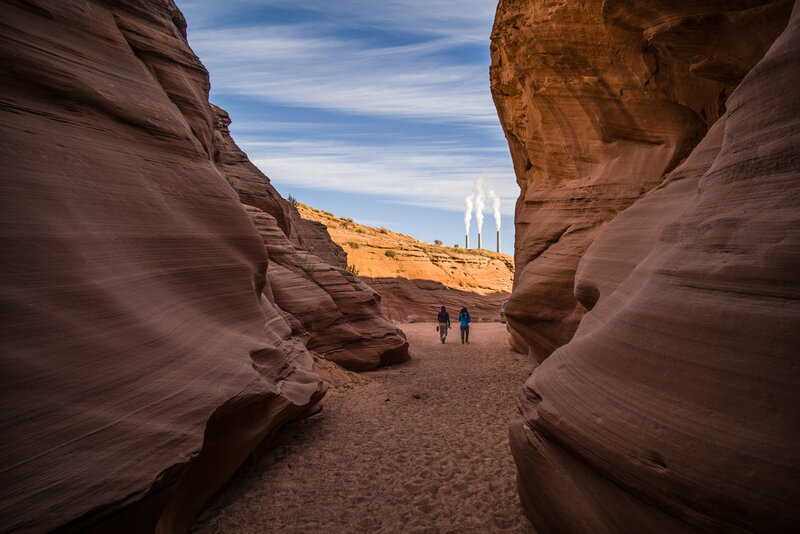 One of the more alluring activists to try and save Glen Canyon was a woman named Katie Lee. Katie died in 2017 at the age of 98, but when Katie was in her 30's she floated down Glen Canyon posing her young naked body against the naked rock of the canyon. You can read about Katie, and see some of those photos here. Katie's attempts, failed but her photos remain. However, she never stopped and was an active member of the Glen Canyon Institute, an organization dedicated to restoration the canyon. Regardless of pro-dam or anti-dam, the dam is an impressive demonstration of human accomplishment. As you walk over the bridge right in front of the dam, you observe a 710 high concrete structure holding back 30 billion cubic meters of water on one side and on the other side is the acclaimed Colorado River winding through a 700 ft deep gash of ruby sandstone. Above the river on the shoulder of the cliffs stands an electric subsystem that delivers the 1,300 megawatts of power to Western states from California to Nebraska. Horseshoe Bend is just a couple miles out of town. You have likely seen photos of the "Bend'" but standing on the edge and looking down is an experience. As you hike the mile from the parking lot through the desert to the view point, you have no idea what is ahead. Harsh beauty but not stunning. However, as you approach the edge and peer over, you will be amazed. The Colorado River weaves it's way through red rock. You don't need a degree in Geology to fathom the amazing power of this river over time. The red color of the rock perfectly compliments the green color of the river. Try and come at sunset. Bring water to drink because there is none available and a light for the walk back because you are in the desert. 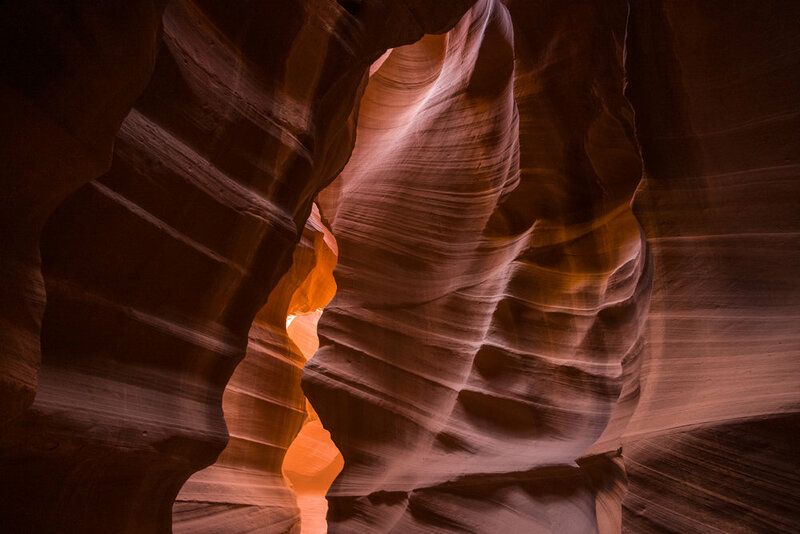 Antelope Canyon is on the Navaho reservation. 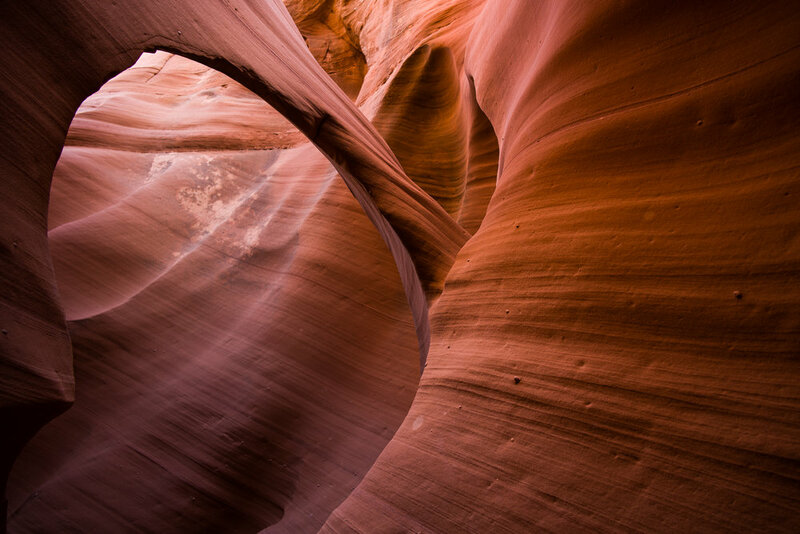 You must visit the canyon with a Navaho guide. There are many different tours available. We chose the photographer's tour which allowed for a few minutes of private time without the crowds. Drive out before dawn, you pass the Navaho Generating Station coal power plant. Like the dam, this plant is yet another demonstration of human will. At 2250 megawatts, this coal plant generates almost twice the power of the dam. The NGS plant lies on Navaho land and provides economic benefit and jobs to many of the Navaho that live here. There is pressure to close coal plants and NGS is on the list. The Navaho nation is trying to keep the NGS running but the environmental concerns on coal are real. The current plan is to close the plant in 2019. You can easily see the stacks of the coal plant about a half mile away when you meet up with your guide at dawn. I signed up for the 3 canyon tour. With the stacks in the distance we loaded up in a 4WD truck and drove through the desert to visit Rattlesnake Canyon, Owl Canyon and finally, Antelope Canyon. At the first two canyons you might be the only visitors. However, at Antelope Canon the crowds are thick. Our guide explained that in peak season there will be up to 6,000 visitors a day. Words cannot describe the beauty. Enjoy the images.